without a visit to Miss Linwood's Picture Rooms at Leicester Square. Mary Linwood opened the Saville House gallery on the second floor in 1809. Brother Henry and Sister Eliza, the Countess, taking it all in. Jane mentioned niece Fanny buying her "Irish" [lace?] 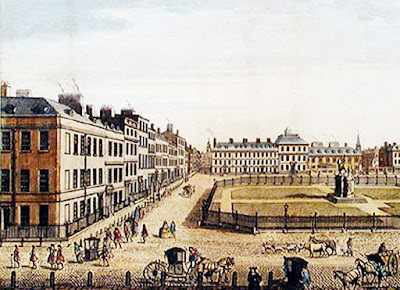 at Leicester Square in 1813. The square was a shopping and entertainment area. 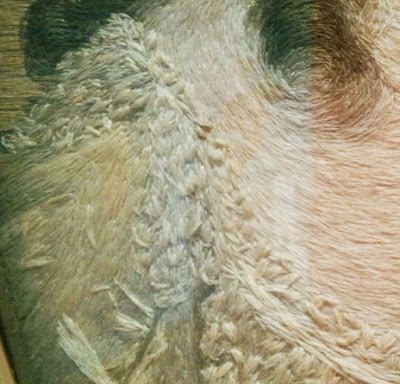 The textiles were layered with close stitches in custom-dyed wools. needlework picture of a painting. Collection of the Victoria & Albert. 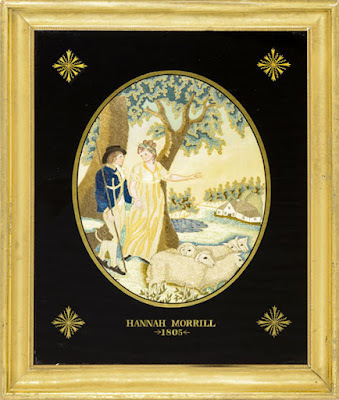 Mary Linwood was only one of many needlewomen working these fancy pictures at the time. 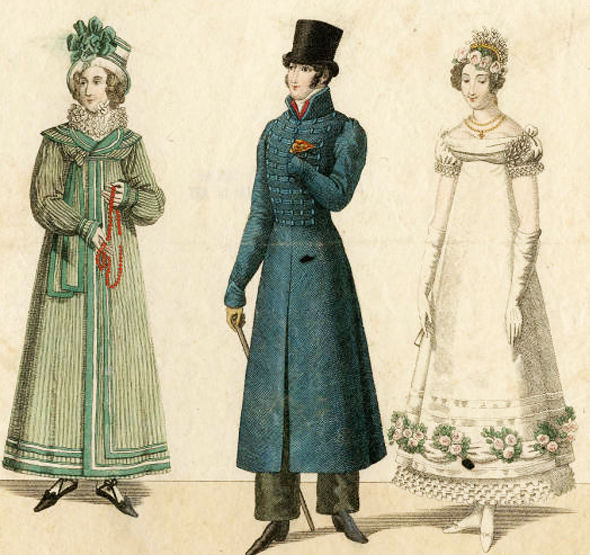 The accomplishment was curriculum in a finishing school or in lessons from a high-end needlework teacher. 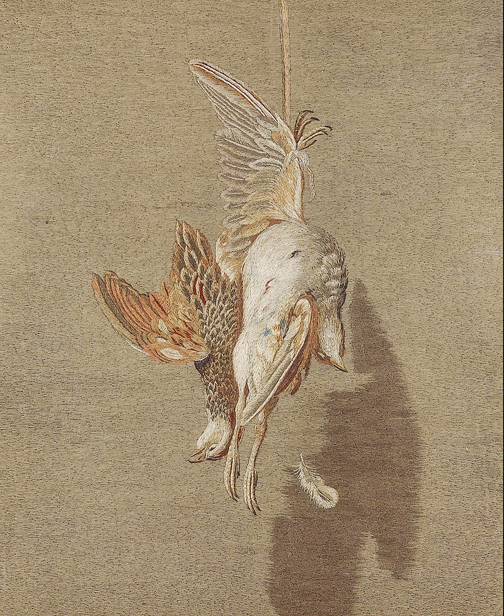 Silk embroidery after "American Lamenting" by Robert Edge Pine. But Miss Linwood was not only a skilled embroiderer. She was excellent at publicity in the era from King George III through the first decades of Queen Victoria's reign. Her first gallery was at the Pantheon on London's Oxford Street. 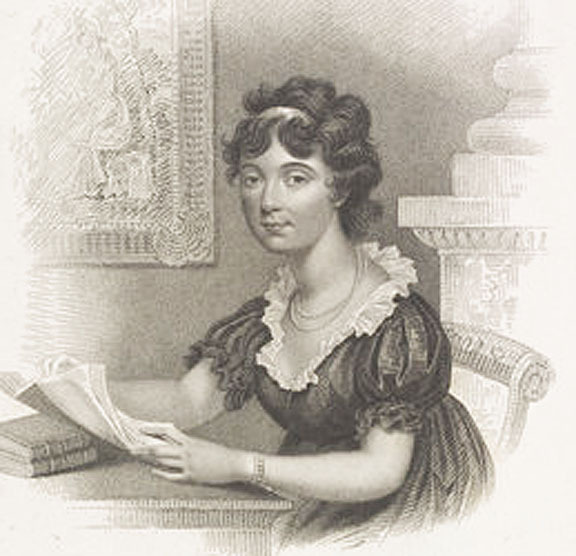 "The great variety of Landscapes, Game, and various other pieces which are the production of this unrivaled genius, cannot fail of giving pleasure to all, and particularly to those who patronize the arts, as even the pencil of a Raphael cannot surpass, in beauty and effect, the elegant productions of Miss Linwood's needle." 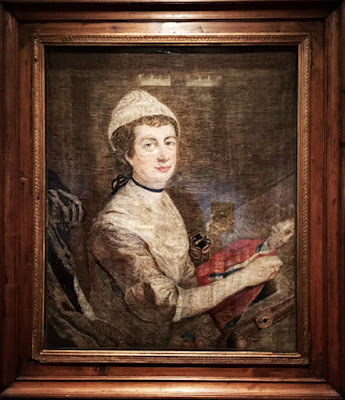 Textile expert Meg Andrews tells us that she gained fame by exhibiting the needlework at the exhibitions of the Society of Artists in 1776 and 1778 with an embroidered landscape. 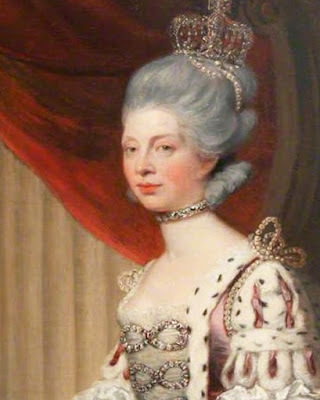 "In 1785 she was summoned to court at Windsor by George III to show her work and according to the Morning Post 'several pieces of needlework wrought in a style superior to anything of the kind yet attempted' for which she received the Queen's 'highest encomiums'." 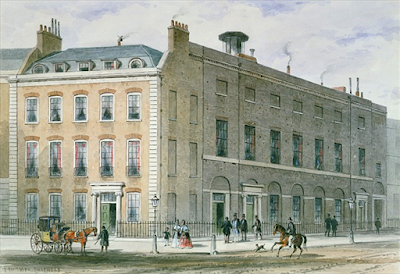 She made the most of the Queen's interest in her work, opening her gallery at the Hanover Square Concert Rooms, which moved after about a decade to the Saville House location. Mary Linwood's work was admired by European royalty and association with her seems to have done a painter's career some good. Her embroidery of Thomas Gainsborough's "The Woodman" is supposed to have contributed to his reputation. 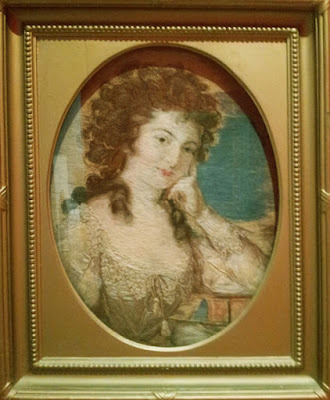 Linwood realized she could sell these needlework pictures for a good deal of money but she did not. She probably made more by keeping them together in her museum for decades ---one estimate of the yearly attendance: 40,000 patrons. During my last sightseeing trip to London I actually saw two of Miss Linwood's pictures at a folk art exhibit at the Tate. They---shall I politely put it---were not to my taste. Roseanne and I didn't even notice them. There was a lot less fussy art to look at. 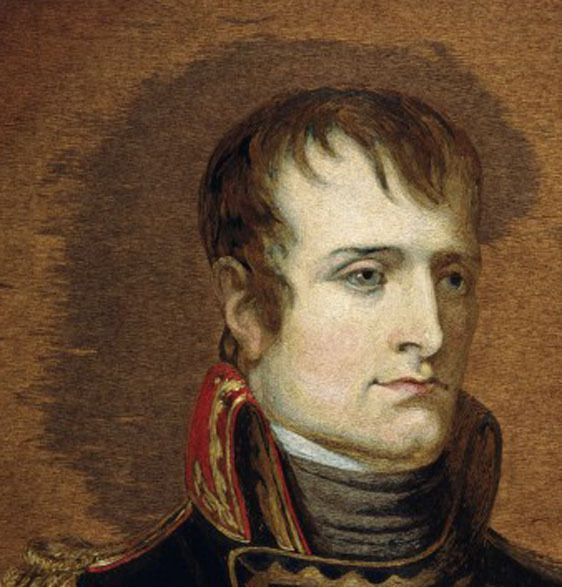 seem to date from after 1800. 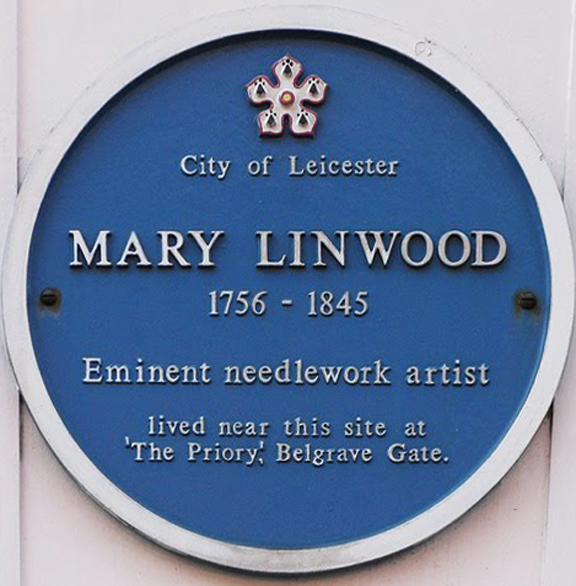 Even if embroidered copies of paintings are not to one's taste, one has to admire Mary Linwood for her entrepreneurial spirit. 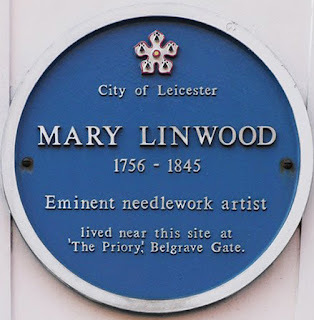 She ran a school in the town of Leicester, taught there, operated a thriving tourist attraction in London for forty years and embroidered 64 (?) elaborate needlework pictures, dyeing the wool and drawing the designs from paintings. 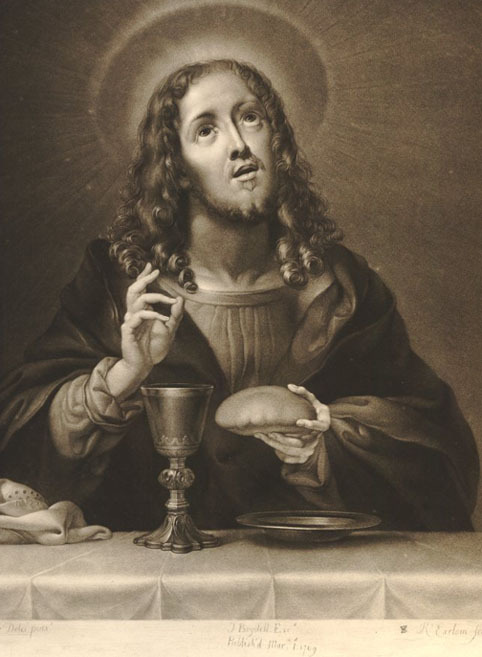 She is reported to have spent several months visiting the Earl Of Exeter's home where she copied a painting by Carlo Dolci. 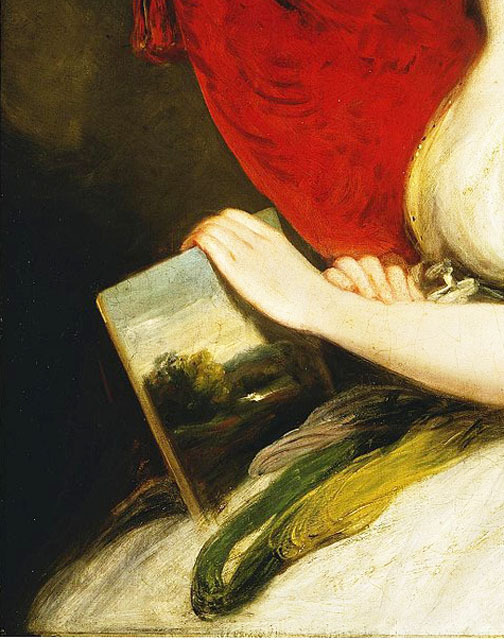 She made enough money that she could buy paintings to keep and copy at her own home. 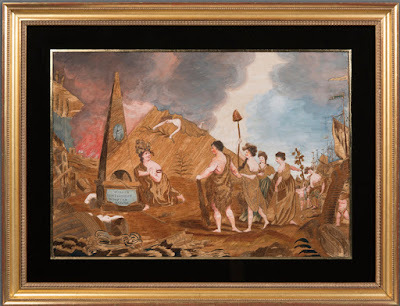 One of her last pieces The Judgement of Cain supposedly took ten years. 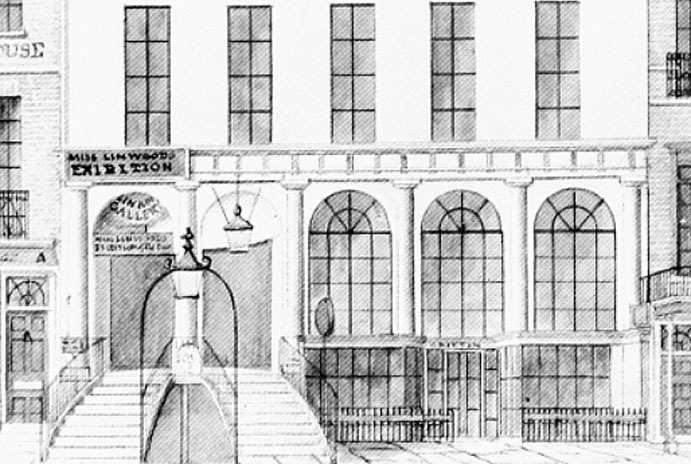 "An extraordinary instance of industry. 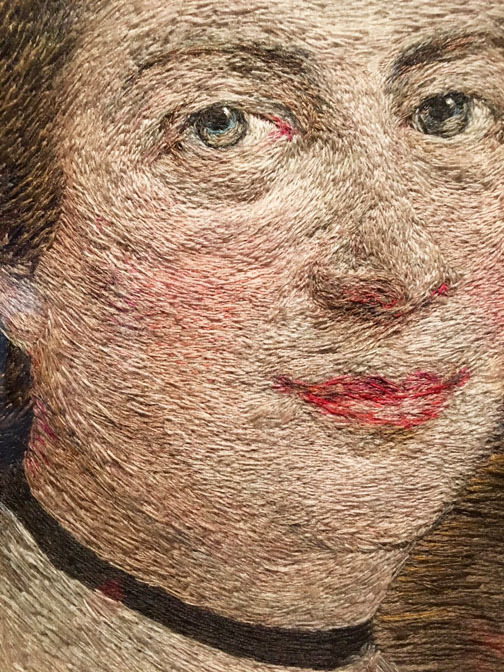 It is calculated that she has worked 1500 square feet of needlework." She did not copy the paintings. 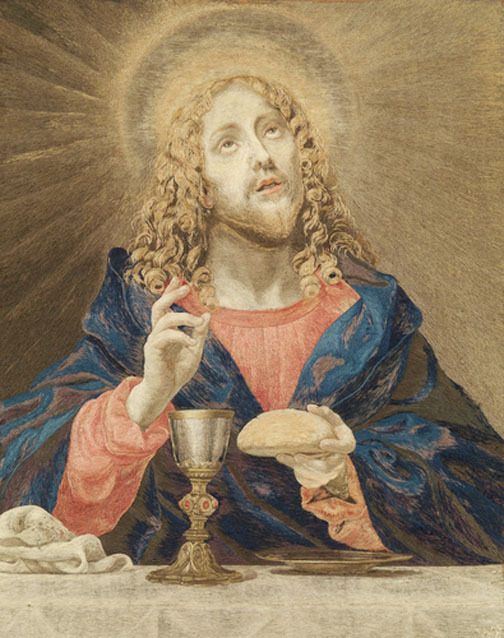 When I can find the original painting I see the needlework pictures are loose interpretations. 2) I am always suspicious about prodigious amounts of needlework. How much actual sewing did Miss Linwood do? Maybe she just designed the canvas and set her students or paid sewing women to work. Or did she design them? "Linwood began her work with drawing and occasionally added painted passages to the crewel work. 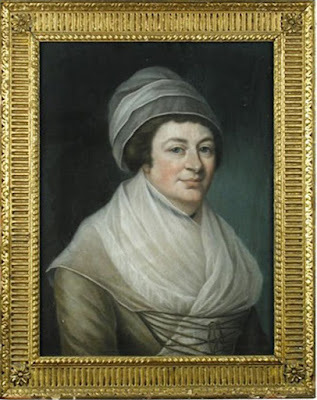 She had some kind of arrangement with John Constable (1776-1837), whose niece, Alicia Whalley, was a student at the Linwood boarding school in Leicester and through whom the famous British artist met Linwood. According to a letter written by Constable in 1802, he painted the background to an ox for Linwood." 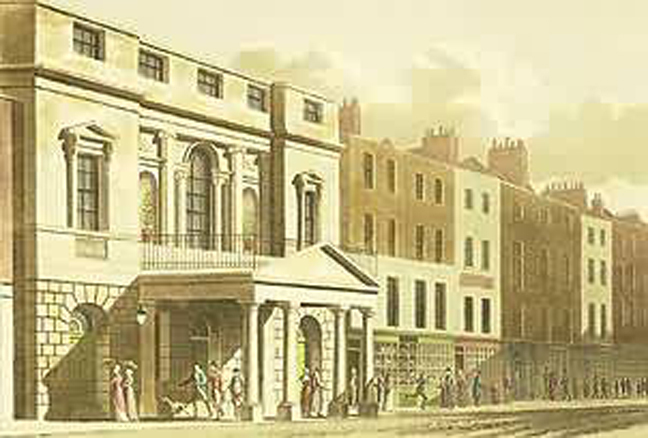 "I understand you are to be in Leicester Sqr on Friday Morning come early--and bring your Paints with you. I've brought the Landscape for a little more force to be given--you will easily do it when I've pointed it out-do not fail to bring your paints." The whole phenomenon of Miss Linwood's wool paintings is a bit of a mystery. What was the attraction that made it the toast of London for decades? Perhaps novelty. We've seen needlework painting copies and landscapes ad infinitum in museum collections. (I guess I just don't care for them.) Perhaps hers were the first? Truly novel? By the time Miss Linwood died in her 89th year the fashion for the wool embroideries was passe. 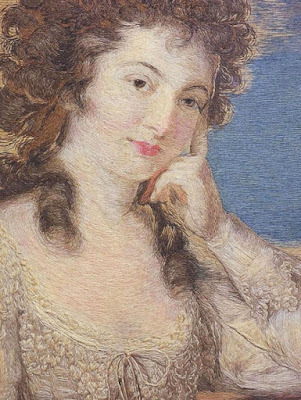 She hoped to give the group to a museum but none was interested and they sold individually at auction after her death for a fraction of what the Russian Czar had once offered. The resemblance here is quite close. 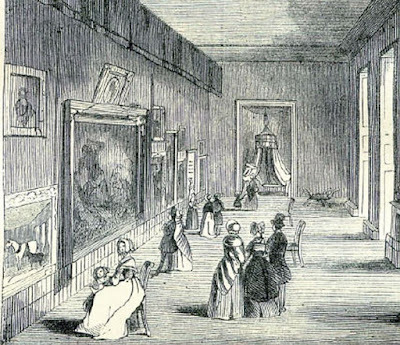 She willed the Carlo Dolchi piece to Queen Victoria and it remains in the Royal Collection. Although not my cup 'o tea either, I think her skill was beautifully shown in this article. Thank you or sharing Miss Linwood's work and legacy. Those really are amazing, even if she didn't stitch every single stitch, just the imagining of it is amazing. 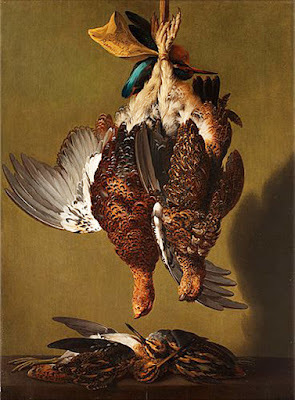 I like some of them very much - and the pheasants in her stitchery are much more interesting than the painting. Thanks for sharing this history and artwork. It's such a shame that her collection held so little value at the time of her death. I think a museum really missed a wonderful exhibit there. Wow, what bunch of research. Top notch as usual. Thank you, very interesting bit of history!! I happened upon your article doing a bit of blog hopping. I was delighted to see it as embroidery especially antique needlework is my primary interest. It also interested me because there is an artist in Mississippi or Louisiana who has recently gotten some notice/awards for her portraits in wool. Thank you for posting this extremely interesting blog post, I did not know Mary Linwood before now.